Lower right, in black chalk: "Miss Lala 21 Janv 79"
Edgar Degas captured the circus performer Miss Lala in her most thrilling act: clenching a bit between her teeth, she is hoisted slowly to the circus rafters. Her strength and concentration are conveyed by the diagonal sweep formed by her outstretched arms. The gestural strokes surrounding her body echo this diagonal. Degas's color palette heightens the dramatic effect; shades of electric blue contrast powerfully with Miss Lala's brown skin punctuated by a shock of black hair. Miss Lala performed her feats of strength and agility at the Fernando Circus, which opened in northern Paris in 1875. The Circus was a popular destination for artists. In addition to Degas--who lived nearby--Pierre-Auguste Renoir, Henri de Toulouse-Lautrec, and Georges Seurat each attended and painted the Circus. Degas was especially captivated by Miss Lala's arresting act and sketched her on successive nights in January 1879. This important study in pastel is one of several preparatory drawings that culminated in the artist's celebrated oil painting of Miss Lala's performance, now in the National Gallery, London. The pastel also reveals Degas's working process. 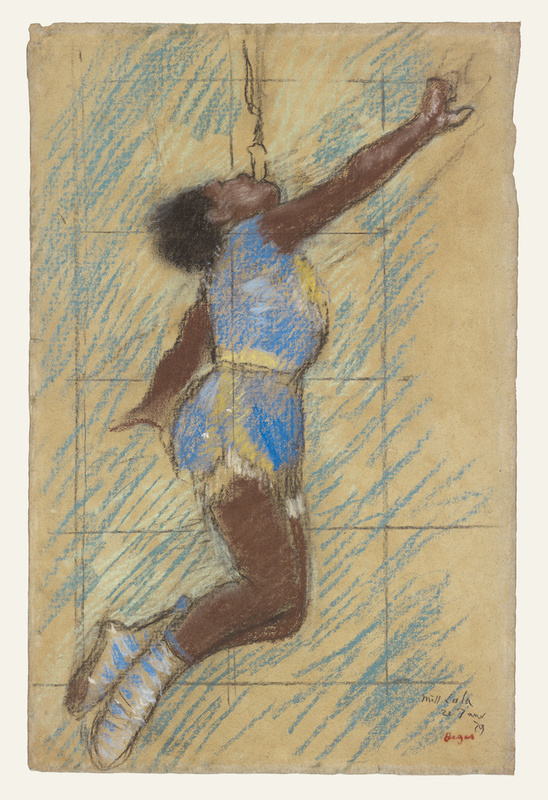 For example, numerous pentimenti--especially in the thighs and right hand--show that Degas made adjustments to Miss Lala's pose on paper as she dangled above him. What Can Art Tell Us about Ourselves? Lesson in which students compare vocations in 19th-century French artworks with those they might encounter in 21st-century Los Angeles.